With over 40 years experience, M & G Olympic Products Ltd, specialises in the design, manufacture and installation of custom-built architectural metalwork, including Balconies and Balustrades. Full CAD design and development is available to comply with Building Regulations and to clients specifications. Site surveys are undertaken. 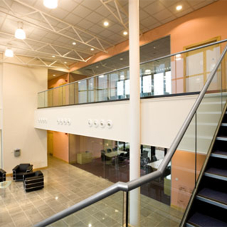 Balcony balustrades are manufactured from stainless steel or galvanised or polyester powder coated mild steel. Infill options include toughened glass, solid or perforated plate or bar infills. Site surveys undertaken. Installation by the company¿s own skilled engineers.